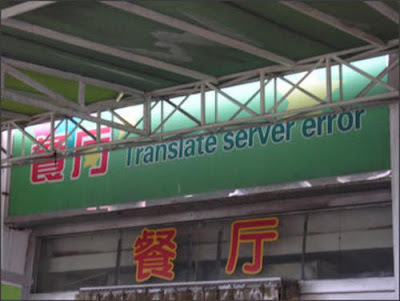 Chinese restaurant named TRANSLATE SERVER ERROR: Wanna open a franchise? According to a reader comment on Boing Boing, the Chinese actually reads "dining hall" (canting, 餐厅). Also courtesy of a clever reader comment: Don't forget to try their Short Stack Error. Or the 404 Not Pound Cakes. I've done some proofreading for friends and such, and in a tract about animal wildlife in Thailand's national parks, I had to correct ช้างป่า translated as "wide elephants" (think about it) and "underground trees" to "undergrowth". One doesn't know whether to laugh or cry. Usually laugh. For a virtually infinite supply of unintentional comedy, Engrish.com be to happy making you the website laugh! From a promising new blog, Papaya in Thailand, comes a must-read article on the sad state of the Thai educational system. The critique applies to all levels of education, straight up to the tippy-top. He should know, he teaches undergraduate and undergraduate students at a Thai university. The article is lengthy, but well worth the time. The issues raised will determine the very future of Thailand. It's time to face the music. In today's world Thais, like everyone, can no longer afford to be a กบในกะลาครอบ. 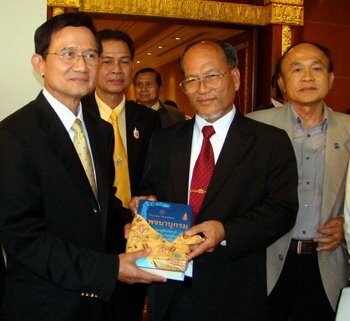 Thailand's Ministry of Education has published a new Pattani Malay-Thai/Thai-Pattani Malay dictionary, in a limited run of 3,000 copies. Each book also comes with a CD. It will not be for sale, but will be distributed to schools, libraries, and government offices. The lexicographers behind this new dictionary is a team of researchers from Prince of Songkhla University, Pattani Campus, headed by Worawit Baru. The team compiled the dictionary over the course of two years. It is reported to contain some 12,000 words, and weighs in at 596 pages. It also reportedly uses the Thai script to transcribe the Malay dialect, which I'm curious about. From my reading of news articles, they use Thai script exclusively and don't include the traditional orthography, Jawi script. Although claimed by some to be the first dictionary of Pattani Malay, in fact Prince of Songkhla University previously published a Pattani Malay-Thai dictionary in 1984. It stands to reason that the new dictionary builds on the previous work. The stated goal of this dictionary is to enable better communication between the Thai Buddhist national majority, and the local Thai Muslim majority in Thailand's troubled southern provinces. Pattani is located on the Malay Peninsula, near the border of Malaysia. Pattani Malay, commonly referred to by Thais as Yawi (ยาวี, the Thai pronunciation of Jawi), is the majority language of this province, in which 88% of residents are Sunni Muslim. Thai Education Minister, Somchai Wongsawat, left. MOE publicity material, is presumably Worawit Baru. Read the MOE press release in Thai here. Details and more photographs here. Those interested in learning more about the Pattanai dialect Malay can read, for example, this article about pronouns in Pattani Malay (in Thai, DOC format). Pattani Malay has previously been the subject of several Thai Master's and PhD theses (e.g. abstracts here and here), which cite the earlier Pattani Malay-Thai dictionary. As a blog about Thai language and culture, here's one aspect of Bangkok culture I haven't covered before: the culture of putting up with regular house fires. My in-laws have lived in the same house for 30 years, in an older part of the city with a mixture of older wooden houses and newer cement ones. We stay with them a few nights a a week. Obviously, this was a wooden house. I wasn't home, so I only experience the aftermath, and the lack of electricity for seven hours. Nothing to freak you out after a fire like having to eat dinner by candlelight. This is the second fire this year in our soi. A few months ago the top stories of half a dozen sections of a ตึกแถว building were badly damaged after some incense caught fire. That was much further from us, so this one is scarier. Word in the neighborhood is that kids playing with matches started this one. Bangkok is no stranger to fires, of course. But if yesterday had been windy, things could have easily ended up differently! An eggcorn is "an idiosyncratic substitution of a word or phrase for a word or words that sound similar or identical in the speaker's dialect." 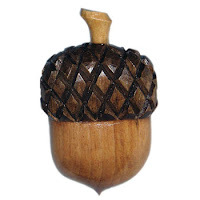 These linguistic nuggets get their name from one example of this phenomenon: A fair number of people think the word acorn is actually eggcorn. So the word "eggcorn" is an example of a linguistic eggcorn. These are listener's errors--mistakes we make when we hear words but never (or rarely) see them written. Our mind analyzes them in a new way that make sense to us, but isn't strictly correct. Usually there's a semantic connection, which is why it makes sense to us (acorns are vaguely egg-shaped, after all, so it's an understandable leap to make). There are plenty of these in English: "all intents and purposes" becomes "all intensive purposes", "duct tape" is often called "duck tape" (there's even a Duck Tape brand of duct tape as a result). Well, today I finally discovered a real live Thai eggcorn, and it was my mistake, to boot. I love discovering this stuff. I just don't know why I never realized it before. Thai has the phrase อุ้งมือ, referring to the area formed by the cupped palm of the hand. If I found a tiny frog, say, and held it in my cupped hand, it's in my อุ้งมือ. I know this term and use it. And yet, somehow, I have been mistakenly using the phrase อุ้มพระหัตถ์. That's my eggcorn. You see, I go to church at a Thai congregation, teach Sunday School in Thai, the whole nine yards. So I talk about religion in Thai a fair amount, and this involves knowing my share of ราชาศัพท์ (royal vocabulary), for use in speaking about kings or deities. The real phrase is อุ้งพระหัตถ์ (notice that's อุ้ง, not อุ้ม). Of course, พระหัตถ์ is simply the ราชาศัพท์ word for hand. อุ้งมือ and อุ้งพระหัตถ์ mean the same thing. One would use the phrase อุ้งพระหัตถ์ to say something like "it's in God's hands"--เรื่องนี้อยู่ในอุ้งพระหัตถ์ของพระผู้เป็นเจ้าแล้ว. Today I found myself typing the phrase, and as soon as I typed it, I realized the mistake I've been making. Something about seeing it written down. There's also a phonetic reason for why อุ้ง becomes อุ้ม. The word อุ้ง ends in the nasal sound [ŋ] or 'ng', a velar sound, and พระ begins with the sound [pʰ], a labial sound. When speaking quickly, you're already closing your lips to make the พ [pʰ] sound by the time you've even gotten the ง [ŋ] sound out. That leads to [ŋ] becoming [m], through the phonological process known as assimilation (the specific variety of assimilation here is labialization). This means one sound in a word becomes more like another nearby sound. That's why so many people pronounce sandwich as samwich--the [d] is elided, and the [n] is influenced by the [w] immediately following it, causing it to change to [m]. Basic phonetics. Maybe that sounds like mumbo jumbo to you, but it's true. I checked. So I was changing อุ้ง to อุ้ม without really realizing it. And the semantic connection here is that อุ้ม means to hold or carry, as you do with a young child, so in my subconscious mind it kind of made sense, since we use our hands to carry things. Interestingly, the same thing happens with อุ้งมือ. Because the sound immediately following ง is ม [m], it's also likely to assimilate to [m]. So while not particularly widespread, this is still a fairly common mistake to make. For all I know, I picked it up from someone else subconsciously. Obviously อุ้ง/อุ้มพระหัตถ์ is much less common than อุ้ง/อุ้มมือ, but I find it interesting that the ratio between the proper and eggcorn form is nearly identical in the two pairs--almost exactly 5%. If this is a representative sample (and I can't say that it is or isn't), as many as 1 in 20 Thais makes this mistake. I think it's so cool to learn stuff like this. See the Eggcorn Database for many, many more examples of eggcorns from English. My talk yesterday went well, titled Thai in Transition, and the Thai Gigaword/Terabyte Web Corpus, and well attended by those who I wanted to hear it. For those just tuning in, the conference was National Language Policy: Language Diversity for National Unity, hosted by the Royal Institute and several other organizations in Bangkok this past Friday and Saturday. I've posted a PDF of my Powerpoint slides here. See my previous posts here and here (the talk abstract is at that last link). This is a last minute post, but this weekend is the Royal Institute's conference that I first wrote about in January, with the title National Language Policy: Language Diversity for National Unity. It's being held at the Twin Towers Hotel in Bangkok today and tomorrow. Registration is a rather exorbitant $175 US for the conference--more information at nlp2008.org. Word has it there will be on-site registration. I'm presenting Saturday at 1:45pm on the topic I previously posted about. Each talk is allotted a scant 10 minutes with 5 minutes for questions. Mine should come in between 9-13 minutes, and hopefully I don't sound too much like the Micro Machine Man.